This volume discusses various institutional, legal and operational aspects related to the provision of air navigation services, taking particular consideration of the current implementation of a new generation of communications, navigation and surveillance systems for future air traffic management (CNS/ATM). The primary intent is to critically review the current mechanisms for international co-operation in this field. Particularly in Europe, many efforts have been undertaken to enhance air traffic management by harmonization and integration of national developments but many parties claim that these are still insufficient and the processes are still dominated by the individual States. Following a short description of the historical developments, the global framework of cooperation established through ICAO is described, supplemented with a description of some multilateral organizations active in the field of air traffic management on a regional basis. The basic technological and operational changes envisaged with the implementation of the Future Air Navigation Systems (FANS) are described and, based on these, related institutional and legal aspects are discussed. Particular emphasis is given to developments in Europe, where during the last four decades several initiatives for enhancing the cooperation of States could not overcome the fragmentation of the airspace. The decisions of February 1997 of the ECAC Ministers of Transport on an Institutional Strategy are reflected. 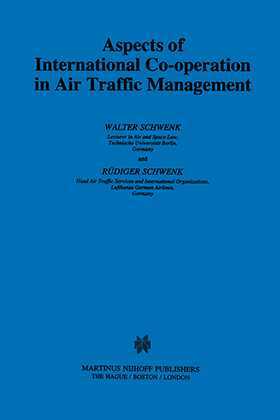 One chapter is devoted to questions of liability in air traffic management which are of particular importance with regard to international cooperation.